Students have petitioned for degrees and/or certificates from the colleges of Arts and Sciences (255), Agriculture, Forestry and Natural Resource Management (17), Business and Economics (33), Pharmacy (1), Ka Haka ‘Ula O Ke‘elikōlani College of Hawaiian Language (9), and for various post-graduate credentials (14). Born and raised in Lahaina, Maui, Baybayan currently serves as Navigator- in-Residence at the ‘Imiloa Astronomy Center of Hawaiʻi, developing wayfinding activities, curriculum, and educational materials that engage individuals of all ages. He has been an active participant in the Polynesian voyaging renaissance since 1975, as captain and navigator onboard the iconic Hawaiian double-hulled voyaging canoe Hōkūleʻa, as well as the companion canoes Hawai‘iloa and Hōkūalaka‘i. Baybayan most recently took part in the three-year Mālama Honua Worldwide Voyage, which wrapped up in June 2017 after traveling 42,000 nautical miles, visiting 150 ports in more than 20 countries, and training a new generation of navigators, educators, scientists, and community stewards. 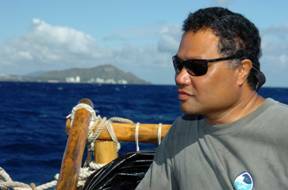 In 2007, Baybayan and four other Hōkūleʻa navigators schooled by Master Navigator Mau Piailug, traveled to the island of Satawal in Micronesia where they were inducted into the Order of Pwo, a 3,000-year-old society of master deep-sea navigators. The Pwo initiation is a sacred ritual where students of traditional navigation are formally recognized as Palu (navigators). They officially become master navigators upon the death of their teacher; Piailug passed away in July 2010. Baybayan earned a BA in Hawaiian Studies from UH Hilo in 1997 and an M.Ed. from Heritage College in 1999. Anne Rivera, a Communication major, represents the graduating class as student speaker. Born in Poughkeepsie, New York, Rivera transferred to UH Hilo in Fall 2016 after earning an AA in Education from Guilford Tech Community College in Jamestown, North Carolina. Since coming to UH Hilo, she has maintained a cumulative GPA of 3.85, made the College of Arts and Sciences (CAS) Dean’s List each semester, and was awarded a CAS Dean’s Scholarship in June 2017. Rivera is just as active outside of the classroom. Working with New Student Programs (NSP) in the Division of Student Affairs, she provides support and assistance to first-year students, including freshmen and transfers, through various programming designed to build a foundation for their academic and social integration. She also leads a team of student ambassadors who help support those initiatives and others within NSP. Rivera also works as a public information intern in the Office of the Chancellor, writing articles for posting online. Her commencement address will acknowledge the achievements of the graduating class, while expressing gratitude to everyone who supported them. She also will issue a call to action that she hopes will empower and inspire her classmates by reminding them that commencement marks only one chapter in their lives, and they have much left to accomplish. Rivera, whose goal is to become a communication professor, plans to attend Georgia State University to pursue an MA in human communication. The graduate program is paired with an internship that will enable her to assist faculty in teaching undergraduate courses.